Life has been good for me despite a few minor obstacles. Recovering from medical issues (radiation, chemo etc.) and still working (trying to keep up my pace of the past 20 plus years) is an interesting game. I've found the way to do it is to prioritize. After a large abscess in my neck was discovered in the nick of time (a by product of perhaps a surgical infection - cutting off oxygen to my body), a trip to the hospital was made and the problem was removed. After three weeks plus in the hospital I am finally transitioning out on day passes. Tomorrow is Monday June 21 - my intended discharge date..... fingers crossed (Happy Father's Day BTW!). My summer will be for healing. I would love to gig live but ..... prioritize! I intend to do that for another 50 years and I don't want to mess that up. I will do sessions in my basement and elsewhere where necessary but only if I'm up for it. Prioritize! My health is important. My great rewards come (now more than ever if that was possible) from my family and I want to be selfish and spend as much time with them as possible. Prioritize!! Health comes first. Everyone knows that and anyone that doesn't isn't a great influence on one's overall well being. Lots of love to my friends and family as well as extended acquaintances (fans from the road who come out and support myself and the artists I work for). You guys are best. To the Johnny Reid and One More Girl friends ... sorry I'm going to miss you on the upcoming dates but I'll be back stronger than ever soon. In the meantime enjoy their shows.... they have some great stuff on the horizon. Finally, a BIG thank you one more time to the all of the artists, friends and fans who attended, organized and played at the Mike Norman benefit and fundraiser on April 7. A lot of money was raised and it was an evening I'll never forget. All the best and stay healthy - see ya soon! Another great thing about being a self employed musician are the surprises that life throws at you. Take for example a call I received in February 2010 from Loverboy vocalist Mike Reno and his girlfriend vocalist Catherine St. Germain. "Hey Mike, do you wanna go to St. Maarten in the Caribbean for a gig?". The answer of course is yes. "Great - you'll be playing with four singers whose music you grew up on as a youngster." Cool ..... wha??? I knew music was my career path at age 14. It became clear to me when I heard Duke Ellington, Errol Gardner, and Count Basie from my Mom's record collection. It became really clear as my palette expanded - bands like Chilliwack, Skywalk and Steely Dan crept into my awareness and inspired me to no end. From there I was hooked. Allow me to focus in on four acts during that time. Survivor - led by former Ides Of March singer Jim Peterik - consistently provided rock anthems that were staples on rock radio during the 80's. 'Burning Heart', 'The Search Is Over' and 'I Can't Hold Back' were among their biggest hits and featured the thick soulful vocals of Jimi Jamison. Toto - some of Los Angeles' finest session musicians formed this supergroup which featured great songs executed with perfect musicianship. 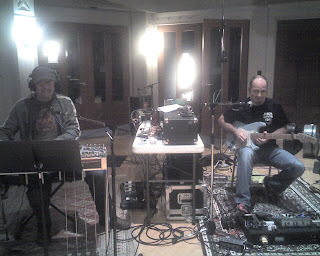 The keyboard section of David Paich and Steve Porcaro influenced me greatly - as did the soaring vocals of Bobby Kimball (BTW - check out the great Tubes' song 'She's A Beauty' - that's Bobby on BG's - amazing). Their record '4' won a truckload of Grammys. 'Hold The Line', 'Rosanna' and 'Africa' are classics. John Cafferty And The Beaver Brown Band - timeless rock and roll performed by a true rock and roll band. With great songs written by leader John Cafferty - they hit the big time when they were featured on the soundtrack to the movie 'Eddie And The Cruisers'. Their "overnight success" was 11 years in the making. 'On The Dark Side' and 'Tender Years' are timeless. Loverboy - Five SOLID musicians, great rock songs, great vocals, great performances - a TEXTBOOK example of a great rock band. Loverboy were the arguably one of the biggest bands of the 1980's and continue to rock venues to this day. On a personal note (while they all influenced my playing style) let me say keyboardist Doug Johnson is one of the finest synth players ever. His endless creativity, tastefully crafted parts and fine technique should be held in the same regard of Keith Emerson, Rick Wakeman etc. Simply brilliant. Along the same lines - vocalist Mike Reno is brilliant and sounds as good today as he did thirty years ago. 'Working For The Weekend' is routinely played on radio stations everywhere at 5PM on Fridays. SO - back to the gig: a few sets in St. Maarten playing the hits of the aforementioned bands with vocalists Bobby Kimball, Jimi Jamison, Mike Reno and John Cafferty. Let me try and articulate how strange this is for me. The opportunity to play songs which contributed to the soundtrack of your younger life with the people who created these hits is .... well .... wonderfully strange. These people who, up to this point, were nothing more than images on a TV screen or magnetized cassette tapes were now real. You knew they existed, but seeing then, HEARING them, therefore confirming they're real people .... just plain strange. And WONDERFUL. I'm feeling a lot better. Thanks to everyone for your well wishes after my last post. I'm starting to eat soft foods (ice cream, applesauce, miso soup ....mmmmmm) and getting my act together. I am still getting lots of rest and taking it easy HOWEVER the other thing I have added into my day to day diet - gigs and sessions. Let me tell you something - music is GREAT for the soul. 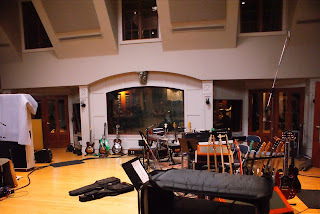 I was thrilled to be invited to The Armoury studios to play 5 days of sessions for various artists. Within those five days I came alive. The band (The Lyin' Bastards - Tom McKiliip, Jerry Adolphe, John Dymond, John Ellis and Jay Buettner) all commented on how much better I became between Day one and Day five. I ain't gonna lie - when I play music these days, I cry. I cry tears of joy. I feel great and I realize how much music is a part of my being. It enlightens everything in my life - my family, my friends, my city .... find the music you love and turn it up. Sing, dance, chant .... it'll make your world that much better. I have gigs coming up for February! I play the Feb. 14 medals ceremony for the 2010 Olympics here in my hometown! The band is great - bandleader Ed Henderson, Jerry Adolphe, Darren Parris, Adam Rohrlick and some new friends - Neal (a great sax/ tabla player), AJ (sitar) and T (a DJ). It's a big multi cultural show that I'm really looking forward to. The great multi instrumentalist Daniel Lapp is also on the show. I've never played with him before but welcome the opportunity. Also - there's a bunch of other great shows I get to do with One More Girl, John Lee Sanders and David Gogo among others. 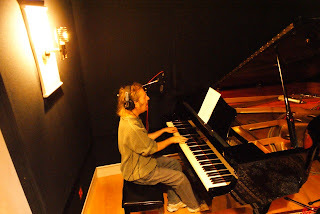 In between the gigs and my R&R, I'm finishing up Yvan Petit's solo record. It sounds terrific BTW.... can't wait for everyone to hear it. That's it for now - go Canada go! Happy New Year everyone. It's January 1 and I write this after a flight home from Penticton, B.C. and a lengthy nap. I like 2010 a lot so far. 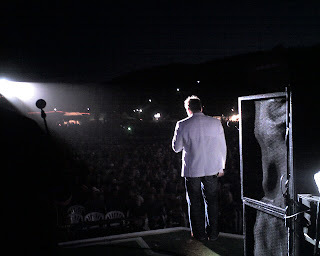 I played a great gig last night with Johnny Reid in the aforementioned Penticton. 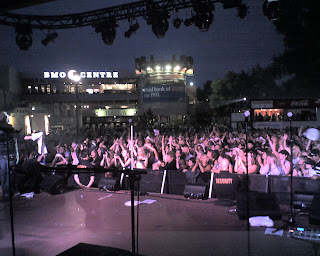 It was my first bigger concert gig in a long time - September 2009. I haven't been much of a blogger for a while and here's why: In October 2008 I had a small section of my tongue removed due to a cancerous ulcer which had developed on it. I was given a clean bill of health as of April 30 2009. It was a week or so after that where I noticed a lump on the left side of my neck. Raising my suspicions, I went to the doctor. A series of tests confirmed some cancerous cells from my tongue made their way to lymph nodes and started to multiply. On July 7 2009 I went to an oncologist for a 2nd opinion on the lump. They confirmed I have two to three lymph nodes with cancer in them. The good news is it's unlikely it had spread into the rest of my body. On July 17 2009 I went in for surgery under the capable hands of Dr. Anderson who removed the ulcer on my tongue. He performed a left neck dissection whereby he cut open my neck and removed as much (hopefully all) of the cancerous areas he could. He ended up taking out 10 lymph nodes and part of my jugular. He says he took out more than he needed to just to be safe. I haven't drank alcohol since 1994 and even before that it wasn't very much. I've never done drugs - including the herbal stuff. And - I've never smoked cigarettes. So how did I get this? Well, the simple answer is bad luck. It's basically a virus and for some reason it manifested itself in this way. I recovered well and went on the road for three dates with Johnny on July 31, 2009. It went pretty well! Life went on as usual - I started work as a producer with Yvan Petit (Johnny's longtime guitarist) on his great solo record, the Canadian Country Music Awards (fourth year in the house band! ), sessions for Dean Maher, David Wills and others. The doctors felt (after reviewing my case) that because I was young (ish) and healthy (other than the cancer) that a radiation and chemotherapy program would be a positive step - get rid of every last cancerous cell so we wouldn't have to deal with this again. I agreed. On September 7th I entered the Surrey Memorial Hospital (conveniently located next to the BC Cancer Agency) for the first of 33 radiation treatments and 3 chemo cocktails. Everything was good for the first couple of weeks. I managed to work a bit and I managed to eat. My last full meal was with my good friends Adam Rohrlick and Chris Meister - delicious tortilla soup and burritos (BTW - as you read you'll see why food is my favorite thing in the universe right now). It was around October and a quarter of a way into the treatments that I became very tired and lost my appetite. I couldn't eat, drink or talk. I would go to a treatment, come home, watch TV and sleep. The option of a feeding tube inserted into my stomach had been offered to me by the knowing staff at the Cancer Agency but of course I was a tough guy and dismissed it. It wasn't until one day I got out of bed and fell back down. I could barely walk and was blacking out. There was no way I was coming in for treatment today .... however once you start they don't want you to stop for anything. So a call was placed by me and my beautiful brother in law and bass player par excellance Shane Hendrickson came and picked me up. We went to the Cancer Agency where they hooked me up to an IV and got me back to a better condition. A week later I was the proud owner of a GI tube in my stomach. I was admitted to hospital for 12 days and was closely monitored. The radiation and chemo ended on October 26. I had no voice, lost some hair in the back of my neck, a sore mouth and throat and had lost nearly 40 pounds. The expected recovery time was two to three weeks. As it turns out, as I write this I am still recovering. I spent November and December mostly in bed. It was tough for me to have to sub out of Tom and Alison Jackson's Singing For Supper Christmas tour as well as CP's Holiday Train which I've done for the past 5 years - both great cross Canada tours benefiting food banks. The fact was I needed to get stronger. Of course all parties involved were incredibly understanding and I transitioned out of both tours with no problems (thank you all again). I slowly got better but the one thing I couldn't (and still can't do) is eat. For some reason I can't get food down my throat. It is for that reason the GI tube was so necessary. I miss food so much. I treasure the smell of it so much. Thanks to the help of my wife Wendy the tube feeds went well. I managed to get some strength back. Wendy became a great nurse - changing my dressing on the tube, keeping the bed and towels laundered, picking up supplies and doing a million other things while trying to balance her already insane schedule. She's awesome and I owe her an awful lot - I love you. Wendy went to Edmonton for Christmas where her family lives. From there my sister Kimi and brother in law Shane took over. I was in there care. They switched me over from the Boost supplement drinks I was taking in the GI tube to Vegan smoothies and vegetable juices. We went to Vancouver Island to be with our Dad and Nana for Christmas. I stayed on the couch again for most of it - feeding tube in tow. A parade of guests came through to say hi - I didn't eat Christmas dinner but it was a wonderful trip. My Dad is amazing. He and his girlfriend Vicki are so supportive and my Nana is incredible. I have a wonderful family and I love them all. Kimi and Shane kidnapped me and I've been living at their house on the couch again where they continue their program with me. I feel a lot better - however the 'not being able to eat' continues. This is the next hurdle we are trying to overcome. As soon as I can eat I can gain some weight, get my strength up and everything else will fall into place. And so, here it is - January 1, 2010 - a new year - a new decade. A little older and deeper in debt. The cancer is gone. The recovery is nearly over. I'm ready to work. Resolutions? Yeah - I have a few. I'm gonna take more time for myself. I'm gonna hang with my family and friends a lot more. I'm gonna get to the gig earlier and leave a little later. I'm gonna sit in my back yard and listen to music. I'm gonna go a little slower. The daily "to do" lists will generally not get done on THAT day. This is a beautiful life we have, people. If you were like me - work crazy - reconsider. I'll always be a little work crazy but I'm sure gonna enjoy the benefits surrounding it. I have the greatest job in the world. People envy me up on a stage in front of copious amounts of people. I'm gonna savour that more now ..... for as long as I can. I have amazing friends - I know so many people and the support I've received has been unsurpassed. It's been an emotional time for me. I cry tears of joy an awful lot these days - many of you have bore witness to this. I am so happy and blessed to have you all in my life. Thank you. So now, I finish up this "note' and it's January 2. What's up for me? Not much on the books but work will come in. Yvan is coming out here in January and we're gonna finish his album which stalled due to my condition. It's gonna be a great year. Always is! Take care everyone. I write this as July comes to a close. So far the summer has been ablaze with it's familiar sights and sounds - fairs, outdoor music festivals and mini donuts among other things. The donuts you know about... here is a brief account of some of the gigs I have done this month. Canada Day (July 1 for the tourists) was in Toronto in Woodbine Park with One More Girl for a free concert. The 10,000 plus crowd were great and the girls put on a great show. The band (Denis Dufresne, Darren Savard, Tom Mckillip, Gary Craig and John Dymond ) took no prisoners and played the gig like they'd been doing it for years. The record company reps were out in force and it sounds like they were impressed. his side. Merritt, Dauphin, Rabbit Lake and the Calgary Stampede among others have brought the Tartan Army out in force. Thousands of screaming fans always do wonders for one's morale. Carrying around a shiny instrument such as a saxophone makes you a bit of a spectacle and people seem to like it despite the old adage .... You can tune up a car but you can't tune up a saxophone. Sadly, the Big Valley Jamboree in Camrose suffered some devastating bad luck. The day AFTER we were there, Mother Nature showed who was boss and flipped the mainstage over. As I write this details are sketchy but I'm sure by the time I post this news reports will be filtering out. I've heard of casulties including a death .... I hope this isn't true .... what a shame. Sidney York's record is selling well and she seems to have an endless supply of gigs around Canada which is very encouraging. I started helping Johnny Reid's guitarist Yvan Petit's solo effort. Yvan came to Vancouver for a week where we cut beds, guitars and his vocals for 11 songs. August for me will be spent comping, editing and overdubbing on his project. I'm very excited to be working on it as he is a real talent and the songs (most of them co written with Johnny) are excellent. As a musician, I count my blessings on a regular basis. One of the great perks is getting to interact with other musicians - feeding off their skills, personalities and individual musical ideas. The musicians in my 'circle' are among some of the best in the country - NAY - the world. They are all very high calibre, aware, intuitive, creative, sensitive and very giving. Permit me to tell you about a week in my life and introduce you to some of my drummer friends. 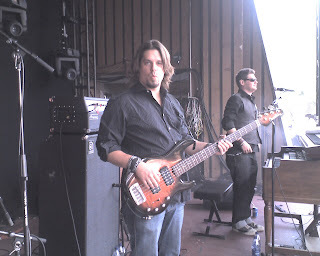 June 27 - Chris Meister - I first met Chris when I started playing for the Rick Tippe band in the mid '90's. He was a quiet unassuming fellow with an excellent sense of humor. We became fast friends and have been playing gigs ever since. Any gig - from a big concert event to a quiet casual (as was the case on this date) is always a pleasure. 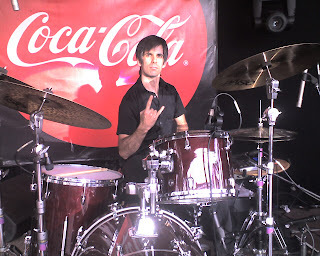 He has a great sense of groove and is effortless to play with. June 29 - Pat Steward - A fellow Vancouver Islander, I met Pat while I was still in college. He had just finished up his tenure with Bryan Adams and had moved on to play with some of Canada's (and elsewhere) elite - Colin James, Jimmy Barnes, Matthew Good and his own band The Odds (among others). 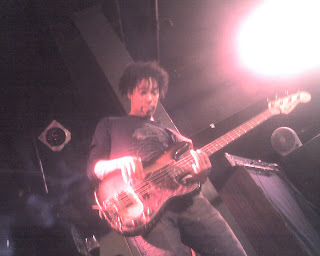 This particular night was the debut live performance of The Rothschilds: a band that Pat and I belong to along with Wide Mouth Mason guitarist Shaun Verreault and Pat's fellow Oddsman bassist Doug Elliot. We played The Yale as part of Vancouver's Jazz Fest. 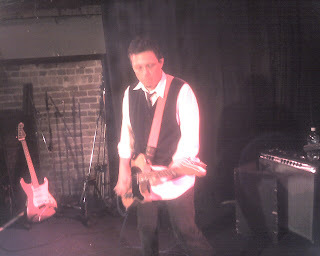 The results were a great night of jam rock / blues. Pat's boundless energy and creativity were a huge driving force. July 1 - Gary Craig - Canada's biggest acts can't be wrong: Blackie And The Rodeo Kings, The Wilkinsons, Anne Murray, Tom Cochrane, Bruce Cockburn, Jann Arden, et al enlist Mr. Craig whenever necessary and with good reason. 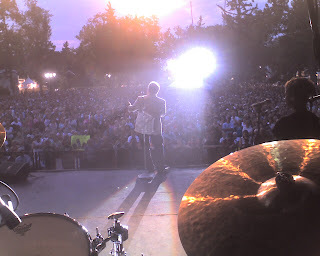 With minimal rehearsal, On this day Gary played the Canada Day Jam in Toronto with One More Girl and NAILED the gig. Tremendous ability, feel and experience make him one of Canada's first call timekeepers. An amazing guy. July 3 - 5 - Chuck Fields / Marshall Richardson - Two of Memphis' finest. Johnny Reid's regular drummer - the remarkable Mr. Fields - could not attend three dates (festivals in Grande Prairie, AB, Rabbit Lake, SK and Dauphin, MB). In his place, Marshall Richardson (whom I just met) steps in. COLD - no rehearsal - he NAILS the show. His remarkable work ethic and attention to detail solidified his place in the Reid band. He recognized the need for the artist to be as comfortable as possible and rose to the occasion. Needless to say the gigs rocked. These are a few of the many - Chris Aiken, Jerry Adolphe, Phil Robertson, Randall Stoll, Chris Nordquist etc etc - I could go on and on about my drummer friends. On the odd occasion I play a gig that is - let's say less than stellar - I know that I can always count on the musical calibre to be high. No more drummer jokes. May and June - gigs abound. Mike counts his blessings! It's been a welcome change to not be on a a plane or a bus for a while. I've had a rewarding month and a half of playing with some great people including some fun nights at the Yale .... I sat in with the Tim Hearsey Band - Jerry Adolphe, Darren Parris and Dave Webb along with THE Mr. Hearsey himself. Bill Henderson sat in for one night with the core Lyin' Bastards band playing hits of old by The Coasters, Wilbur Harrison etc.. It was fun to get Bill out of his routine - he was fantastic. He's a wonderful musician. 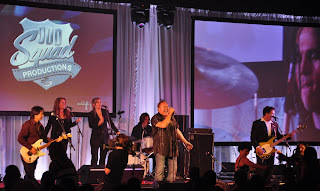 Later on that month we played with Bill again, along with Victoria Banks, Michelle Wright, One More Girl, Lisa Brokop, Aaron Pritchett and others at the Merritt Walk Of Stars gala. 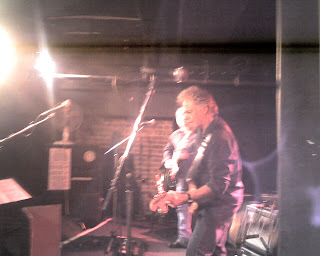 Another two nights of sensational music .... Also, I did a corporate gig with Mike Reno - lead singer of Loverboy. I lived another childhood dream playing hits such as 'Turn Me Loose', ' Working For The Weekend' and 'Lovin' Every Minute Of It' - reaffirming my role as the luckiest man alive. Sessions have been good.... I've done a bunch of overdubs in my studio for various projects. One project I'm very happy with is an album by Sidney York. 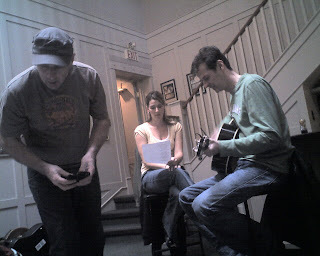 I co produced this record with Ms. York and it sounds great (see past blogs for details). My summer includes dates with Johnny Reid and One More Girl. Preparations for that have begun ... Assembling bands...... Figuring out arrangements, itineraries, etc.. I also have a few dates booked with guitarist David Gogo (who tells me a couple of our co written efforts are on his new record. Awesome). My friend Will Davis was good enough to fly me to Regina. He was promoting four Canadian shows featuring Ms. Carol Burnett. Her shows are essentially a Q&A format - not unlike what she do at the beginning of her classic CBS television show. It was a thrill to meet Ms. Burnett and speak with her about Peter Matz... her brilliant musical director. It's not everyday you meet a living legend. I write this on a plane from Saskatoon to Vancouver. 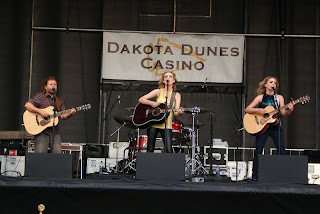 The One More Girl 'power trio' (which is Britt, Carly and myself) opened up for Aaron Pritchett at the Dakota Dunes Casino. It was a fun gig and great to hear the re vamped 'APB'. The band has never sounded better and it was very exciting to hear such a well oiled machine. Aaron, Jay, Scott, Shane and Jayson took no prisoners. Rob Esch had it pumping out front and it was nice to meet Amil (the monitor guy). It was great to hang afterwards and catch up.